Introducing PRF: Use of Stem Cell in dentistry - PRF (Platelet Rich Fibrin) is one of the newest procedures in dentistry. This technique allows your dentist to use your own cells to grow bone tissue. Aria Dental uses PRF in many dental surgical procedures such as tooth extractions and dental implants. PRF accelerates the healing process, decreases surgical pain and swelling for dental implants and Wisdom Tooth Removal. PRF also improves the strength of bone osseointegration to implants. Clear liquid or plasma layer. Yellow thick layer which is the PRF layer. This jello-like mixture consists of fibrin, platelets, white blood cells, stem cells, and bone growth factors. The PRF Layer is a yellow and thick jelly-like biologic material derived from patient blood. 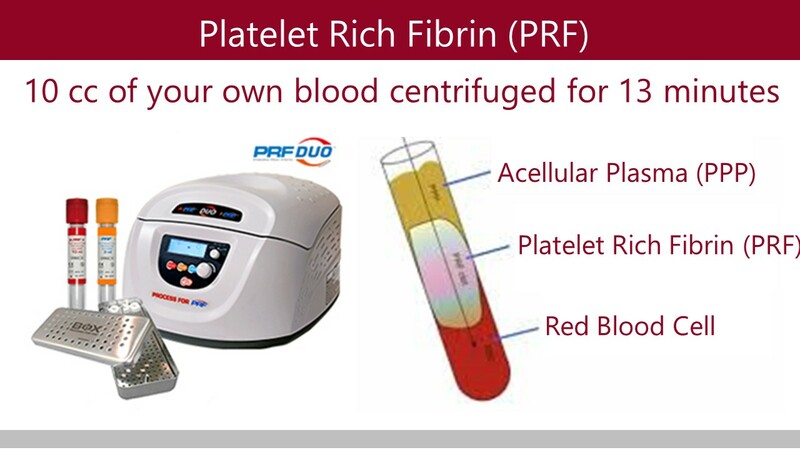 The PRF layer is rich in fibrin, platelets and growth factors. PRF is a much better alternative to sending a tooth removal patient home with an unfilled bony extraction socket or implant site. When a patient loses a tooth or bone due to periodontal disease, that bone can be grafted with bone that dentists buy from different companies which may be cow bone, cadaver bone, or synthetic bone. However, these bones do not have the regular blood supply that a normal bone would have. This lack of blood supply could lead to delayed healing, infection, and less integration of the grafted bone with the patient's own bone. This type of problem has been solved with PRF. In many cases when using this technique, the platelet membrane can be used to signal the patient's body to grow more bone. Accelerated Healing Process after Implant and Wisdom Tooth Removal. Less Pain after Dental Procedures. Accelerated Osseointegration or Healing of Bone to Dental Implants. Improved Strength of Bone Integration to Dental Implants. Decreased Chance of Dry Socket and Cavitation after Tooth Extraction. Increased early blood supply to Tooth Extraction Socket. Facilitates Fast and Proper Healing of Wisdom Tooth Extraction Sites. Lower Infection Risk after Procedure by Sealing the Wound away from Infectious Agents. Safe and Convenience...No Disease Transmission Since It's from Patient's Own Blood. Bone Grafting for Implants: This includes sinus lift, ridge augmentation, closure of a cleft lip, cleft palate deformities, and both inlay and onlay grafts. Bone Repair: PRF can be used in facial trauma reconstruction, repairing of defects due to tooth removal, or removal of growths and cysts. Fistula Repair: This includes the repair of fistulas between the mouth and the sinus cavity.